This Saturday's auction of the ambulance that carried President John F. Kennedy's body has garnered worldwide attention. The only problem? It's a near-perfect fake. Here's how a group of historians discovered the truth about what happened to the real ambulance. UPDATE: The Barrett-Jackson auction house backed slightly away from its initial claims of authenticity and attacked Jalopnik during today's press conference. Our response here. UPDATE #2: The fake JFK ambulance ends up selling at Barrett-Jackson for $120,000 — plus a $12,000 commission to B-J. More here. In a probe with as many twists as one might expect from a JFK assassination artifact, the history buffs of the Professional Car Society were able to not only poke holes in the documentation provided by the seller of the '63 Pontiac Bonneville ambulance, but produce photographic proof that the real vehicle ceased to exist in 1986. After weeks of its own research, and its original touting of the ambulance's history, we're now told that Barrett-Jackson will hold a press conference Friday to reveal the findings we lay out below. Touted since late last year by the auction company, the slate gray JFK ambulance received hundreds of profiles — from the Wall Street Journal to CBS News, almost every major news outlet ran a story about this Saturday's auction. And why not? It's a compelling vehicular tale to tell. When Jacqueline Kennedy returned to Washington with the president's body on Nov. 22, 1963, the Secret Service ordered his remains to be transported to the Bethesda Naval Medical Center for an autopsy. Awaiting the Kennedys at Andrews Air Force Base was a slate gray ambulance, tagged "U S Navy 94-49196," visible in TV footage showing the arrival of the president's casket. Barrett-Jackson announced in December that it would offer the JFK ambulance for sale, saying that it had sat in government storage until it was auctioned for surplus. Auction house president Steve Davis touted its historical value and provenance, with estimates from some that the vehicle could easily fetch more than $1 million. "No one had ever connected the dots, the builder, the manufacturer, the navy and their documentation," Davis told a Phoenix TV station. "There was reports that car had been crushed, that the Kennedys okay'd it to be crushed, that it didn't exist… well, those things have been proven wrong." The ambulance's appearance instantly raised doubts among the members of the Professional Car Society, in part because they had been through a similar case before. A decade ago, a California collector had claimed to have owned the same ambulance, painted slate gray with the same U.S. Navy numbers, but had later dropped his claims. The owner of the Barrett-Jackson ambulance, John Jensen, told several outlets that he had bought it from a California collector within the past couple of years. Barrett-Jackson has in its possession copies, supplied at our request by the consignor, of recently uncovered documents obtained through the Freedom of Information Act from the Department of the Navy/Surgeon General, as well as Superior Coach Corporation, that for the first time, ties the Navy registration number and the VIN number of the 1963 Pontiac Bonneville chassis together. Barrett-Jackson was previously offered this ambulance for auction, by a different owner, but we refused to accept it, based on the fact that there was no VIN documentation, or provenance, that linked this specific ambulance to the Kennedy ambulance. Subsequently the new, and current owner, through an extensive investigation, was able to uncover documents, that, as I stated, for the first time, tie the VIN, and Naval registration numbers together. Documents show, Superior Coach Corporation, in response to a investigation by the Navy, confirmed the Navy registration number, 94-49196, as well as the Navy contract number, DA-20-113-AMC-1236-X, and the serial (VIN) number, 863P198767, of the ambulance that transported JFK, his wife, and brother from Andrews Air Force Base. While additional photos showing matching serial numbers were enough for some of the doubters, it didn't satisfy Dan Brintlinger, who had a 22-year old piece of evidence to the contrary. In 1988, Brintlinger had written his congressman, Rep. Bob Michel, to ask what had happened to the Pontiac hearse. Michael forwarded a response from the U.S. Navy, which said that at the Kennedys' family request, the hearse had been donated to the Kennedy presidential library in 1980 and was later destroyed. As Brintlinger was raising his doubts, questions about the documentation also began to arise, this time from a different source. Historian Paul Hoch, one of the foremost experts on the Kennedy assassination, wrote Barrett-Jackson to question two of the letters the auction house had posted from the FOIA file on the ambulance. The letters were sent from Surgeon General of the Navy Rear Adm. Bart Hogan, and were dated Dec. 10, 1963. The problem? Hogan retired from the Navy in 1961, and was head of the American Psychiatric Association at the time of the Kennedy assassination. On Jan. 11, Barrett-Jackson president Davis replied to Hoch and the Professional Car Society forum again, offering an update on the auction house's investigation. While saying that Barrett-Jackson "is not the entity making the representations as to the history or particular provenance of this car," Davis did say an inspection showed the serial numbers on the Bonneville's parts matched those in the documents. Another factor that has played into our analysis here is the credibility of the consignor of this vehicle. He is a physician and an avid collector, and has gone to extraordinary lengths to complete his own diligence in researching the history of the vehicle. He has also been exceptionally cooperative and responsive as we have addressed various questions with him throughout this process. At that point, the questions stood in stalemate, with the auction house holding one set of documents and the auto historians holding evidence that suggested the original JFK ambulance was destroyed, but no proof that it actually happened. But the longer they looked, the more questions the Professional Car Society found. 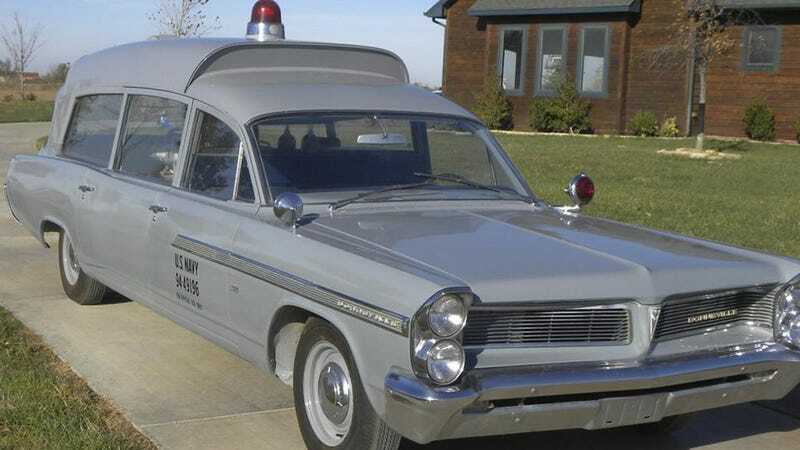 The JFK ambulance was described in some cases as "unrestored," yet the lettering on the sides and rear did not match that of the ambulance shown in the 1963 films at Andrews Air Force Base; the Barrett-Jackson car had periods between the "U" and "S" where the original did not. On Tuesday, PCS director Steve Lichtman got the proof the auto society had sought: On June 26, 1986, the hearse had been crushed in a Boston junkyard, under witness from the John F. Kennedy Library, apparently at the request of the Kennedy clan. Photos from that day show the ambulance with the ID numbers from 1963 still on its rear door. It's important to understand that Barrett-Jackson is not affirmatively making any representations as to the history or particular provenance of this car, and we will be clear about all of these facts with the bidders who register at auction to participate in the sale of this vehicle. What we are trying to do is uphold the high standard we've set for ourselves in following up on legitimate inquiries and questions related to a vehicle as important as the Kennedy ambulance.